To legally drive the roads of Washington State, a driver must be able to show a minimum amount of financial responsibility. Anyone driving a vehicle in Washington must be able to show proof of financial responsibility to a police officer if pulled over or if they are in a car accident. The easiest way to show proof of financial responsibility is to buy car insurance. If a driver is unable to show proof of coverage to a police officer, they will receive a $450 ticket and if they were involved in an accident, the driver and even the non-driving vehicle owner may lose their license. If your car is involved in accident and you do not have coverage, you are personally responsible for all damage done and could cost you even more money if the person you hit decides to file a lawsuit. If you are determined responsible for an accident, you will need to pay for any property damage and bodily injury done to other people. This would include their medical expenses, pain and suffering, and lost wages. This would cover the people in a car you hit, a pedestrian, or bicycle rider. You are also responsible for any property damage you cause, for example to a car, building, fence, or mailbox. All of the repairs to the damaged item are your responsibility and you must repair, replace or compensate for the damages. An auto insurance policy lists bodily injury coverage with a pair of numbers, for examples 25/50. This means the insurance company will pay a maximum of $25,000 for any person’s injuries but a maximum of $50,000 total for all injuries (so if 3 people get hurt they cannot all get $25,000). The third number on liability coverage is for property damage and is the maximum that the insurance company will pay to cover the damage done. In Washington the minimum amount liability coverage you can buy is 25/50/10 (can you read that now?) but you really should ask for a quote for more coverage since doubling the coverage might only cost 10% more and guess who is responsible for anything not paid by your insurance? Your liability coverage also covers defense and court costs for you, too. Defense attorneys and the courts cost money. If you end up in court, the minimum required limits of liability coverage probably won’t be sufficient, but you can purchase higher limits easily. Remember, any expenses not covered by your insurance policy is your responsibility and the other person may even get a judgement against your future wages. Liability insurance is important for every driver’s financial protection. 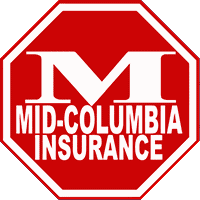 As an independent insurance agency, we at Mid-Columbia Insurance don’t work for just one insurance company. We are able to offer great rates for people anywhere in Washington State even if you have collected multiple tickets, had a few accidents, got pulled over for a DUI, had your license suspended, or even if you drive perfectly. We even have companies that don’t care if you have been driving with no insurance, have poor credit, no credit, or have had a bankruptcy.